The Nintendo Switch has been a notable success this year, and its eShop is attracting more and more indie developers and publishers. One of the most prolific has been Finnish team 10tons, with top down shooters such as JYDGE and Time Recoil, as well as puzzlers and physics-based games including King Oddball and Tennis in the Face. With so much of the company's back-catalogue coming to Nintendo's system, we thought it'd be a good time to catch up with 10tons. We spoke to Jaakko Maaniemi about the company's experience with the console, Nintendo, and his thoughts on the current indie game landscape. Hello, first of all could you introduce yourself to our readers? Jaako Maaneimi: I'm Jaakko, and I handle PR, distribution, and sometimes a bit of game design stuff at 10tons. What has the critical and commercial reaction been like to your line-up on the Switch so far? As a multiplatform developer and publisher, we had a really good idea about what to expect commercially based on our experience with Playstation 4 and Xbox One over the last few years. We were superbly aware of the huge commercial window of opportunity in the early days of the Switch eShop, before the bulk of competition would be there. We got on PS4 very early and our titles did great, and while we got much later on Xbox One, the onboarding process had been slow for other developers as well and there weren't that many titles around. Again our titles did well. We got on Switch at the end of September, and while we'd have preferred to be there six months earlier, the 150 titles or so that were in eShop at that time can still be considered a low amount, and we did see elevated sales for our early releases. Now that the game count has doubled, we're seeing clearly lower sales, but still higher than we'd expect if we were releasing on a fully matured platform. All of this is due to the discoverability issues prevalent in all storefronts these days; once there are hundreds or thousands of titles, the odds of a customer picking up one of yours is just low. A small minority of customers seem to pay attention to games media, as the big dropoff in sales, for all of our games on all platforms, occurs exactly at the moment the game drops off from whatever more or less good spot of visibility it gets at launch. Critically there haven't been any major surprises. Currently the average of our Switch Metacritic averages seems to be 66.6, which is the ballpark the average hovers at for other platforms. Metacritic is very volatile for indies these days, as not nearly all games even get four Metacritic ranked reviews, and with 4-6 ranked reviews, each score may swing the average quite a bit. There's a lot of fluctuation in there. We've struggled to see much correlation between Metacritic scores or reviews overall with sales though, on any platform, so the scores are a minor, but the most easily trackable, datapoint for us. In critical reviews we focus on the content, what's praised and what's critiqued, and try to keep that in mind when developing upcoming titles. Hands down the most meaningful stat for us is user reviews. It's a shame there are no user reviews in eShop, as we'd really love to see whether it'd look the same as on PS4, Xbox One, or Steam, where our titles typically carry a 4 out of 5 or 85%+ positive rating. On Switch we're kind of in the dark regarding this. We do see an equal amount of enthusiasm for our titles on Switch in Twitter than what we're used to seeing for other platforms, so maybe that indicates something. One of our biggest hopes was finding new fans on Switch anyway, and that has certainly worked out. There have been some individual surprises regarding critical reception though. I'm a former games journalist myself and I've reviewed something like 150 titles back in the day, and even for me it's kind of mystifying, yet kind of relatable, how a game like Neon Chrome is rated 95% positive in Steam based on 281 user reviews, yet its Switch Metacritic average is 67. I just noted a pretty wild difference regarding Xenoraid, which is rated a pretty atrocious 56 on Switch, compared to the highest one, which is 68 on Xbox One. JYDGE, which was a big success for us late this year, carries a PC Metacritic average of 81 and Switch average of 67. Be it as it may, it's difficult for us to see this as anything but natural variance, somewhat amplified by the low amount of ranked reviews. Overall, we've been really happy with our fortunes on Switch. Certainly we couldn't have hope for more! You've made games across a number of genres. Are there favourite genres among the team? Top-down shooters are obviously dear to us, stemming from all the way back in 2003 when the company was founded on and for Crimsonland. We're happy we got to work with the genre again first while remastering Crimsonland in 2014 and then with Neon Chrome. The flurry of Neon Chrome, Time Recoil, JYDGE, and the upcoming Tesla vs Lovecraft probably overstates the situation somewhat though, we're not THAT obsessed about it. There were a lot of factors that just steered us that way over the past two years. The great thing about being fully indie is that we get to choose what we make, and that's why we've worked a lot with casual games like the Sparkle titles, physics-based puzzles like Tennis in the Face, and fully unique stuff like Spellspire. Nowadays mid-tier indies like us pretty much need to consider commercial realities quite a bit though, so there's no way we can let our creativity run completely free either. There's also ten developers at 10tons, and we try to have 2-3 titles in production at all times, so individual developer tastes play a big role as well. You have been a very prolific developer for the Switch, with new titles announced regularly. Is there a concrete release schedule in place or is the selection process more organic? 10tons has appeared quite anomalous to the Switch scene, hasn't it? And it's probably true no other indie has done what we have, at least to quite the same extent. There are perfectly understandable reasons to our perceived prolifity though. Firstly, we had 12 console ready titles in our catalog when we started porting to Switch. Well, 10, and Time Recoil and JYDGE just happened to be completed this fall. We had spent years and years building that catalog, it didn't come from nowhere, or by rushing. Secondly, being a multiplatform publisher is the core of our strategy, and our prorietary tech, and our games catalog, are fully made with that in mind, to make porting as easy and effective as possible. And we knew perfectly well that the time to market would dictate 90% of our success, or lack of, with Switch. Finally, Nintendo made the tools and processes for publishing on Switch really developer friendly, so we were able to execute our entry to Switch nearly perfectly. If we'd gotten the dev kits some months earlier, we wouldn't have released our titles on consecutive weeks, as there'd have been less pressure from competition to do so. We obviously had a specific order for our releases, and there were no significant changes on the way. We expected we'd end up improvising a little simply due to the platform and processes being new to us. Sparkle 2 was always the most obvious debut title, as it's one of our best sellers on any platform, there weren't any similar games on Switch, and it's technically simpler than for example our titles with online leaderboards, which is a far more development intensive feature than gamers realize. With the experience we got from Sparkle 2, and seeing as 19 titles released that week, it was immediately clear that we'd need to get our flagship titles out as soon as possible. Neon Chrome followed in two weeks. We agonized whether we'd release JYDGE the next week, but we were disappointed we didn't get it out a couple of weeks ealier when the other console versions launched, so we decided to do it, even though the setup of competing with ourselves was clear. Roughly at this time we had our online leaderboards ready, so it was Time Recoil's turn, similarly motivated by getting our newest titles for Switch gamers with as little delay compared to other platforms as possible. We figured we'd get a full day of storefront visibility before Super Mario Odyssey, as we didn't realize it would launch at midnight. We were even more surprised that so many other titles launched as well, as we were kind of betting nearly all would skirt around Mario. We had a similar gamble with King Oddball the next week, but it didn't work out exactly as hoped either. With the flurry of shooters and flagships out of the way, we were able to go back to diversifying our offerings with Spellspire, another unique puzzle title for eShop. We had a really good idea by this time that everything that had happened on other console storefronts were happening in fast forward on Switch, as everyone seems to be firehosing Switch with games. Next up were Xenoraid and Crimsonland, in this order because it was the way to get a full month between Time Recoil and Crimsonland, which are technically both twin stick shooters, although wholly different experiences. Now we've met our goals, as we have all our flagship titles on Switch, and we've introduced at least one game from the breadth of our catalog. Well, in hindsight we could have swapped Sparkle Unleashed due December 25th with Azkend 2: The World Beneath now slated for January, but overall everything went swimmingly. Looking back a little, what was your exposure to the rumours of the NX? We heard all the public rumors everyone else did, and practically nothing more. But the rumors alone, followed by the official unveiling, made it clear for us that this'd be the platform we'd be making our Nintendo debut with, something we've been dreaming of for years. It was only natural after having settled in with Sony and Microsoft, and we couldn't have been happier to learn that the Switch would be an exact fit for our titles; touch screen, gamepads, mobile, console, plenty of power. We'd wanted to be on a Nintendo platform for years, but the earlier platforms like Wii U and 3DS were problematic due to unique hardware features. We prefer to have our games as identical on all platforms as possible. As you noted above the turnaround in releases has been remarkably quick - what is the system like to develop for? The tools and processes Nintendo has put in place for Switch are excellent. A good anecdote about this is that we got the dev kits on a Monday, and submitted Sparkle 2 to Nintendo's tests on Friday. Almost all of the ports have been made by one developer, with me handling the publishing tasks, so it's been 90% a two man effort to bring ten titles to Switch in less than three months. We needed a couple of attempts with our first few titles in Nintendo's tests, but nowadays we routinely pass on first try. I can't comment in detail about the technical specifics or performance profiles, but I do know there haven't been any major issues. What has your communication and relationship been like with Nintendo? We've had a very practical relationship with Nintendo thus far, mainly focused on current releases. This suits us fine, as we're still in the process of porting our existing catalog and getting a feel for the platform. I'm sure there'll be more chitchat next year, when everyone's hopefully slightly less busy. From your body of work, what game are you most pleased with on Switch, either critically or commercially? 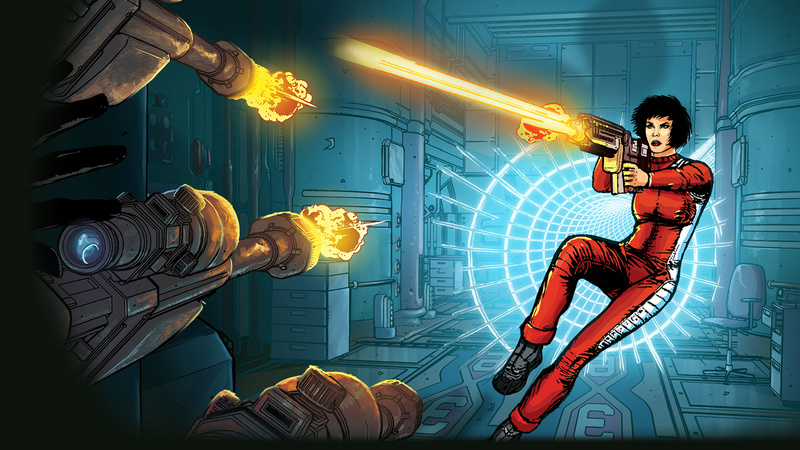 It's hard not to say JYDGE, as it was something of a surprise hit for us this fall. It launched great on Steam, and Switch came actually really really close. It's quite a bit above expectations, and the player feedback has been simply enthusiastic. It's a fun game for sure, I love the happy-go-lucky spin it puts on the moody and broody Neon Chrome. It must be exciting to see your games on a console that is only in its first year, yet is so popular among consumers and the media. It is, although for us the excitement comes mainly from finally being on a Nintendo console. We felt like big boys three years ago when we got on Steam and PS4, already with Xbox One that novelty was gone. But the immense popularity of Switch is exciting, I don't think many expected it to take off this well. I didn't, for sure. Are you working on (or are you interested in) exclusive titles for the console? Our core strategy of multiplatform development and publishing is an exact antithesis of platform exclusives. We thank ourselves every day we made the multiplatform choice years and years ago, it's very difficult to see how we'd survive in this day and age with narrower distribution. 10tons has been profitable every year, and we're celebrating 15 years of indie development next year. Things would certainly be very different if we weren't multiplatform. Does that approach rule out the prospect of Switch-specific features, for example? As multiplatform developers, we've discovered hands down the best way to go is to treat every platform equally. Feature and content parity is mostly required anyway, so if we were to make some platform specific features or content, we might have to make something comparable for the other platforms as well. That would be an enormous burden, and indie life is frankly tough enough these days even without additional burdens. What experience did you have of Nintendo systems growing up? Super Mario Bros. and Duck Hunt on NES, and much more sporadic and fleeting encounters with Super Nintendo, Game Boy, and Nintendo 64. My first Nintendo consoles were the GameCube, GBAs, DS, and Wii during my games journalist days. I really appreciated the wealth of family friendly titles always on offer, even if I personally liked Metroid and Zelda the most. Advance Wars titles are in my all time top-3, and I'm frankly bitter there aren't even many passable clones widely available. I'm hoping for Tiny Metal and Wargroove to rectify that shortly. What are your favourite Nintendo games? While Advance Wars, Metroid, and a couple of Zeldas are probably my favourite ones, I do appreciate Mario (even the Mario Party titles to an extent) as much as anyone. Pikmin was good, Donkey Konga was good... A lot of good stuff in there! If you could work on any Nintendo IP, what would it be and would you stay true to form or make a different kind of game? This is a tough one. I think pretty much all Nintendo IPs are so beloved that it'd be enormously stressful to go either way. If you changed it, a whole bunch of people would be fumbling for their pitchforks already. If you didn't change it, then it'd certainly have to meet in quality whatever the previous title would have been like. Then again, such conservatism may be going away somewhat, seeing as how Ubisoft did great with Mario + Rabbids Kingdom Battle. We'd like to thank Jaakko Maaniemi for his time. Tennis in the Face looks like a good bit of mindless fun. I never thought of their games as being particularly interesting, to be honest I have always passed them up. But hey, at least they're trying. I agree with him that the switch eshop needs a rating system. @dok5555555 Honestly I am glad it doesn't have one. It always seems to get taken over by fanboys or people who are just joining in on whatever is the latest trend to hate on. If you want to know what a game is like that is what review sites and youtube are for. Talking about the number of games on the system, Nintendo really needs to get around to updating the shop. We need tabs for different genres and price range. We should also be able to sort those tabs alphabetically, by release date, and by best selling. For example "platformers -> by release date" or "shooters -> 15-30 dollars"
Right now searching for anything beyond the best sellers overall or recent releases overall is very non-intuitive. Please Nintendo add a Review system, and not just a rating system but require some input... And here's an idea that I've not heard of but if a game doesn't have a minimum rating after a certain time maybe it doesn't deserve or belong to be on the eShop ?? Best thing I saw in there is a user review for eShop. Wholeheartedly agree. Bought 5 of their games, they don't seem to get particularly favourable reviews here on NL but I really enjoy Neon Chrome and Jydge. The switch is a perfect fit for indies like this. Rating system is too obvious and open to abuse from spoilt brats. @Heavyarms55 all that it is there already (and has been there since day one). Go to the first tab and do advance search without writing anything. "even for me it's kind of mystifying, yet kind of relatable, how a game like Neon Chrome is rated 95% positive in Steam based on 281 user reviews, yet its Switch Metacritic average is 67"
If this is "mystifying" to the guy, and he is responsible for PR and marketing, then he simply can't be good at his job. Sorry. "95% positive reviews on Steam" doesn't say anything about how highly any of those users would rate the game, except for a majority apparently awarding it >50%. I highly doubt ANYBODY would rate ANY of their games a 95%. So probably most of those reviews are somewhere around 50%-70%. So, there you go, Jaako. Not exactly rocket science. Big fan of their output,looking forward to see what else they will bring in 2018. I've only bought Sparkle 2 because it was a Zuma's Revenge clone and I really like that game. Most of 10ton's games aren't for me though because I don't care for twin-stick shooters. Nintendo needs to do an overhaul of the eshop asap. It needs more categories like maybe divide the eshop by genre. Then add a Top Indies, Best user score review games, keep the sale, demo and recent releases ones and maybe even add an Nintendo Select or Recommendation. It also needs user scores BUT actual ones and not like the WiiU. Ultimaltely it should be mandatory to put a video of your game plus 4 screen shots. @Balta666 I am aware of that. And that is a terrible, non-intuitive way of doing that. if thats rocket science i have some creation "science" you might want to buy. i think the man has more of a point than youre willing to see. as far as nintendo fans attitudes to prolific publishers i blame rectalmadflaps for re-skinning unity tutorials and then flooding the wiiu shop-front. @KeeperBvK Thanks for the feedback, but you're off the mark. That particular point was a minor thread in the inteview, so I didn't want it to get more long winding than it already was. So I picked the Steam average as one example. I could have picked more, like how Neon Chrome sports a 4/5 star user review average on US PS4 with 540 ratings, same 4/5 in EU PS4 with 840 ratings, again 4/5 for Xbox One (US) with 124 ratings. I could go on, but I think it's clear a lot of players do indeed rate that game, and most of our games, to 4 or 5 stars, or 80-100 points. So it's not a case of me being terrible at my job, and most of the time gamers overall would do good by assuming that most developers aren't terrible at their jobs, as game development isn't so easy that people terrible at it would get far, or get to do it more than a very short time. There is a mystifying aspect to the relatively significant difference in how gamers and critics view games. It's not all mystery though, as I do get the part where critics somewhat need to reserve the higher scores for the very few absolute best releases of each given year, or better yet, attempt to use the full range of scores available. The average gamer may not play nearly as many games per year as a critic would, so a gamer may well rate anything he/she enjoys a lot very highly. And, of course, the amount of critics is very low compared to gamers, so the chances of a game ending up reviewed by a critic who's not very into that type of game or theme are real. Good interview. Seems like they got the whole developing and publishing thing down pretty well. Good, fun games too. I haven't been disappointed with the one's I've bought so far so that's good. Keep it up! @Jason9mm I agree with your comments. One theory is that there’s a positive selection bias for user gamer reviews — I.e., people who decided to buy the game are more likely to be favorably disposed to it than the general gaming population. By the way, I suppose I’m a somewhat uncommon breed of gamer, having enjoyed 10tons’ puzzle/physics games (King Oddball) as well as twin-stick shooters (JYDGE, Time Recoil) across various platforms. Kudos to the developers across the board! The rating system on psn is pretty broken and I think the Wii U one was as well. I think on the Wii U one you at least had to play the game for a certain amount of time though. @TadGhostal @sfb Thanks! I'm glad to hear you've enjoyed what we've done. We've seen there sure is the "variety gamer" type who plays a wide variety of games. But it does appear it's a minority type, with most gamers mostly focusing only on a couple of genres/game types, some even to just a couple of titles. Obviously there's nothing wrong with any of these preferences. Regarding user ratings, positive selection bias is very likely in play. It does make one wonder however, how relevant the neutral, non-selectee view is? As in, how relevant is the opinion of people who haven't played the game? How reliably can one say a food is "bad" without tasting it, or that a car is "bad" without having driven it? But you're probably right that a professional critic may be able to take a game more at face value if it's just thrust upon him/her to review as a job assignment, as opposed to a person looking up a title in store and spending his/her hard earned cash to buy it. If so, the system is kind of working. Didn't realize Crimsonland was also 10Tons. I play that extensively, partly due to the nostalgia. I see that Plasma/Ion/Bullets has been a steady trifecta for them, then. Lots of great top-down goodness with them.